Have you ever considered how far you walk with your dog? If you walk just 15 minutes a day you will have walked far enough in your dog's lifetime to cross the United States. With all that walking ahead of you, aren't you ready for a new place to take a hike with your dog? 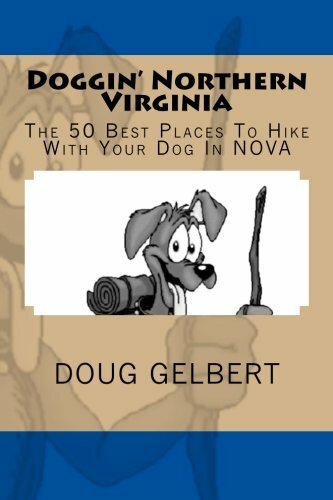 What makes a great place to take your dog hiking? Well, how about a paw-friendly surface to trot on? Grass and sandy soil are a lot more appealing than asphalt and rocks. A variety of hikes is always good - long ones for athletic dogs and short ones for the less adventurous canine. Dogs always enjoy a refreshing place to swim as well. For dog-friendly parks our guides describe the trail options for your dog, evaluate park traffic from other users, tell you whether you will need a guide dog to find your way around and, of course, tell you how to get to the park. The ten-acre Lake Thompson is the best canine swimming hole in Northern Virginia with access right by the road. But don’t bother the trout fishermen. The Stone Fort Trail climbs steadily and relentlessly up the 1,444-foot high Maryland Heights. You’re just walking your dog - imagine pulling five-ton guns up the same route during the Civil War. The River Trail takes your dog to the edge of the 76-foot falls, picks its way along the stee-walled Mather Gorge and twists through a rocky-alpine environment seldom seen in Northern Virginia. Not once, but twice, the Union and Confederate armies clashed in these woods and over farm fields. Long loop trails visit the key battle spots across miles of preserved open space. The park lives up to its name as the meadows climb up the eastern slopes of the Blue Ridge Mountains. If your dog isn’t used to hiking, there are benches spaced along the trail. The 4.5-mile hike around Burke Lake dishes up abundant lake views, plenty of trees, an easy trot for your dog - and even a smattering of tranquility in a heavily developed area. At over 15,000 acres, this is the largest protected swath of land in the Washington DC metropolitan area. Despite its proximity to millions of people the forest trails are refreshingly uncrowded, always an attraction for canine hikers.